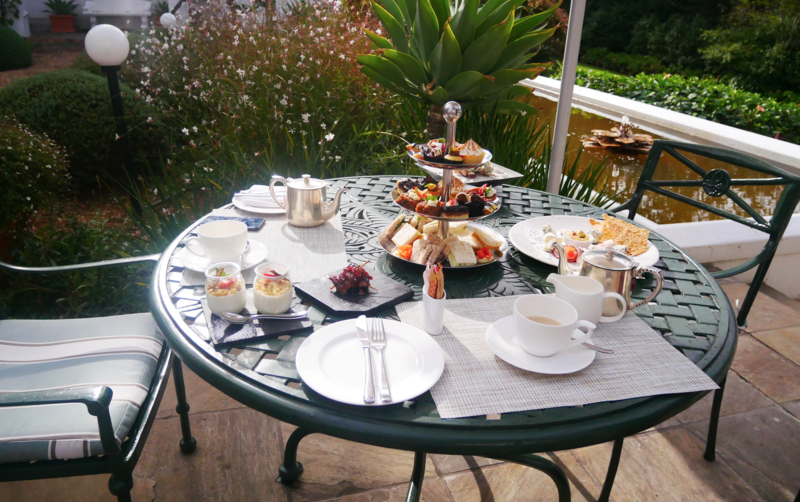 Indulge in a gourmet afternoon tea at the five-star Cellars-Hohenort Hotel in Constantia, admiring stunning Table Mountain views whilst you nibble on savoury delights and sweet treats. High Tea is the epitome of dining sophistication that has been thoroughly, and rightfully, romanticised over the years. Imagine relaxing in 5-star surroundings with breath-taking mountain views, chef-prepared sweet and savoury treats, and fresh tea or coffee in elegant cups and saucers - we can practically hear the pinky fingers popping. 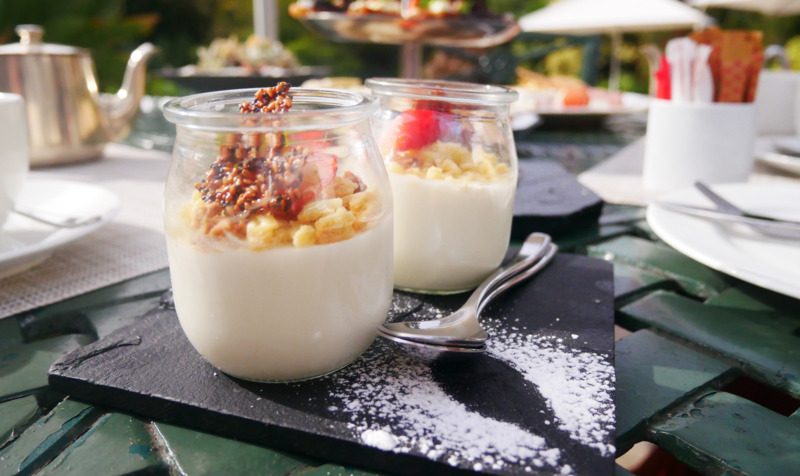 This is exactly what you'll experience during the Classic High Tea at Cellars-Hohenort Hotel in Constantia, a culinary sensation fit for royalty. Served daily from 3pm-5pm, High Tea at Cellars-Hohenort can be enjoyed at your choice of venue; in the Palm Arch, Sun Lounge, or the Conservatory Terrace. Take in the incredible Table Mountain views and gaze across the sprawling gardens as you settle in plush surroundings, sipping on tea or coffee as you await the main event. Make sure you come hungry, as on your tiered stand will be a selection of classic finger sandwiches, savoury tarts, sosaties, and sweets including fresh fruits pavlovas, cupcakes, and Madagascan chocolate cake. The menu changes depending on the seasons and the chef's inspiration, so there's plenty of excuse to come back again! Afternoon Tea can be enjoyed as an indulgent day out with friends, but also makes a fabulous gourmet gift for Mother's Day, a special birthday, or any occasion that deserves celebrating. 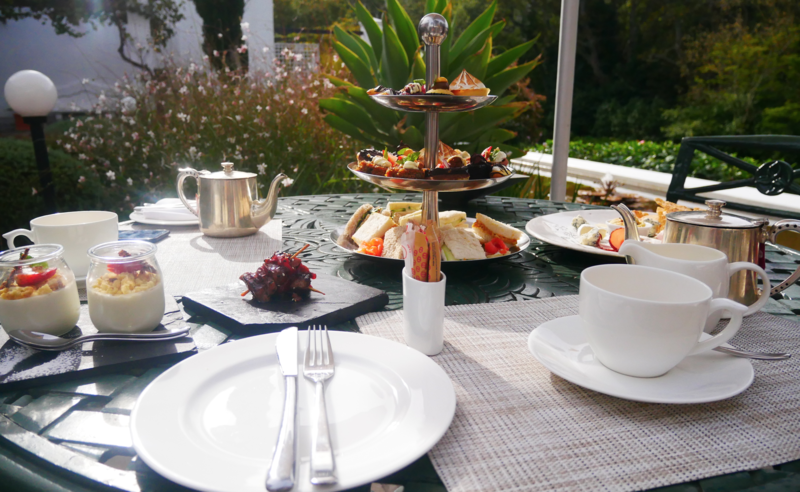 Soak in the gorgeous Constantia Valley atmosphere at Cellars Hohenort and experience a High Tea like no other! 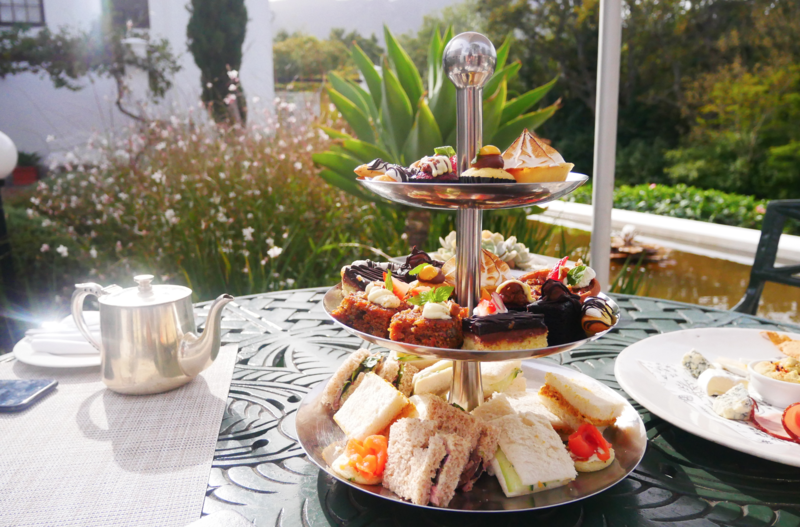 Cellars Hohenort High Tea is served on weekdays and weekends throughout the year, subject to availability. The Classic High Tea at Cellars-Hohenort lasts two hours, from 15:00 to 17:00. Participants: The Cellars Hohenort Hotel Classic High Tea For Two is for 2 participants. Classic High Tea is served on a stand for groups of less than twelve. Groups of twelve or more can book a buffet afternoon tea, please enquire with our customer service team. There is no dress code for High Tea at Cellars Hohenort Hotel. High Tea is generally enjoyed outdoors, but can be moved inside if the weather is adverse. We had a highly sophisticated High Tea experience at the Cellars Hohenhort restaurant. We were greeted and seated by friendly staff and promptly plied with tea, coffee and miniature savoury & sweet confections. The tea selection is wide and appealing, the treats were a delight and the view is gorgeous. What's not to like? High Tea at Cellars Hohenort was a 5-star experience from start to finish, the staff were incredibly friendly, the surroundings were super luxury, and the food was utterly delicious. A wonderful gourmet treat! High Tea is one of those gourmet experiences that cries elegance and sophistication; you can't help but put on your best dress, enunciate your words, and sip daintily with pinky fingers popped. 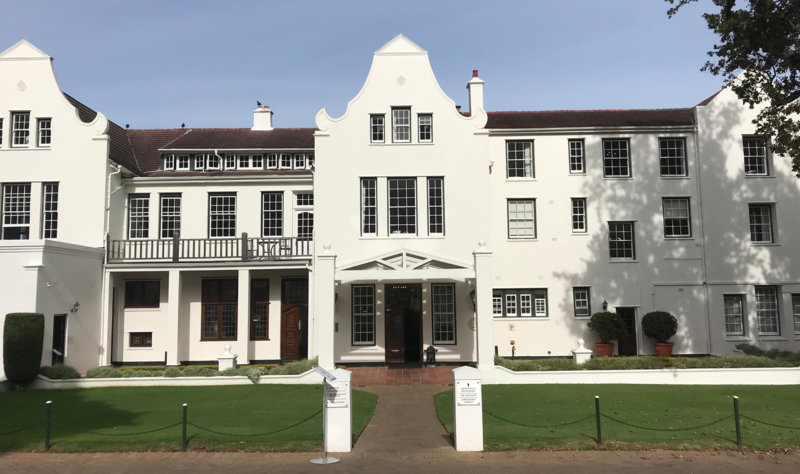 Cellars Hohenort Hotel encompasses every aspect of this classy dining experience with extra pizzazz and glamour, serving up a mouthwatering selection of savoury snacks, sweet treats, and a wide range of teas and coffee. We arrived on a sunny afternoon to see what all the fuss was about, so read on for the full review! On arrival we found parking easily and wandered into reception, unsure of where the high tea actually takes place. Thankfully, several staff members were on hand to point us in the right direction and graciously show us to a table on the patio. The sun was shining on the gardens, illuminating the pond and the bright flowers - the perfect setting for afternoon tea! The menu is fixed but there are a variety of add-ons you can choose including fresh scones, extra sandwiches, delicious pastries and decadent cakes. We went for the classic menu which includes unlimited tea and coffee, kicking things off with a pot of Darjeeling and Vanilla Rooibos. Because we'd booked in advance our food came swiftly after the tea - the kind of service I could get used to! On the three-tiered stand was a selection of cucumber cream cheese, Coronation chicken, and beef mustard sandwiches, plus beef sosaties, vegetable goats cheese tarts, and smoked salmon blinis. The sweets included mini eclairs, itsy bitsy cupcakes, fruit pavlovas, chocolate cake, pecan tarts, carrot cake, bite size lemon meringue pie, an exotic yoghurt type pudding that wasn't on the menu so we couldn't quite figure out what it was, and a curious coconut millionaires shortbread. In ultimate sophisticated style we decided to top things off with a glass of Graham Beck Brut Rosé (R90 a glass), bringing a fabulous experience to a fabulous end! The savoury food was absolutely to die for - I could have eaten a hundred of the sosaties - and the sweets were varied enough that we each decided on a favourite. Plus we got to take home what we didn't finish! What really made this experience, however, was the amazing Cellars Hohenort staff, who were so incredibly accommodating and friendly and made us feel like VIPs - this makes such a difference to any dining experience. If you're looking for a unique Mother's Day gift, are celebrating a special occasion, or just want to be fancy with your friends, the Classic High Tea at Cellars Hohenort in Constantia is the ideal setting. We had a wonderful time and can't wait to return to see how the menu changes!